If you’re like me, you treat your cats better than they deserve. Well, maybe not deserve, but let’s face it, we treat our animal friends like they were our own children. The problem with doing that though, is they get too comfortable with what they expect from you. That means, when buying them essentials like food, your cats can get picky. A picky cat isn’t the end of the world, of course, but if they’re not enjoying the food in their dish, chances are they’re going to tell you. At least, that’s what my cats do. As such, made it my mission to find the best cat food around. 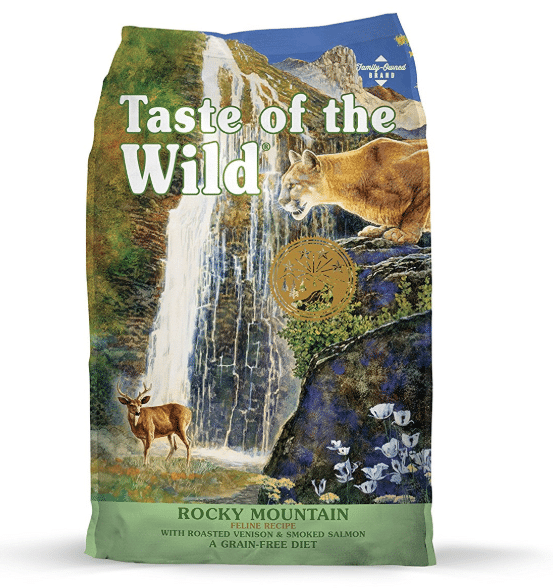 After serving my feline friends countless products that they didn’t approve of, I finally settled on my favorite bag of cat food: Taste of the Wild – Rocky Mountain Dry Food. My cats love it and I’m sure yours will too. But, if they aren’t satisfied, I have 9 more foods for them to try. Let’s take a look at each of them with my reviews! 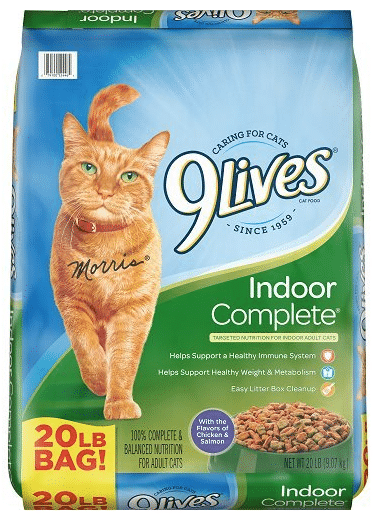 If you’ve been searching for a quality dry food that your cats will love, this bag of goods should satisfy their taste buds. One of the best things I noticed about this food is that cats tend to eat less of premium food, rather than stuffing their faces with budget-based pellets. Along with the great inclusion of meat, you’ll find added vitamins and minerals that provide ample nutrients to satisfy a long lifespan and healthy weight. I decided to try out this brand of cat food due to the overwhelmingly popular reviews across the internet. One thing I always remember with products is that people tend to leave negative input, rather than positive, so if this food was bad I would’ve found out. I love looking at the ingredients list and seeing all the quality pieces, and the business is family owned and operated. I like supporting family businesses that pride themselves in well-made products. Quality, premium cat food doesn’t come cheap, so be prepared to spend some dough on Taste Of The Wild bags. That said, remember your cats should eat less (since they’ll be fuller longer from the good meats inside each pellet.) Also, while they have a phone number listed, I found it hard to reach somebody with a question I had regarding the food. Another company that prides itself on quality ingredients is Blue Buffalo. As such, one of my favorite dry cat foods is the Wilderness line. Part of the reason it’s nice comes from its 100% grain-free recipe, while also including premium deboned chicken. Your cats should enjoy the Omega-3’s and fatty acids, which help with any digestive problems. I noticed that my cats’ coats were also shinier, which is something we can all agree is nice. The best part about buying premium-grade food for your kitties comes from the vitamins and minerals, which really seemed to help overall health for my felines. All in all, if you want a dry food that provides much of the same nutrients as a raw diet, this may be the one for you. Like I said, a visible difference in my cats’ activity levels, coat and skin health, and overall mood was present. It may seem weird, but if you know your cats well, like all good owners do, then you’re bound to see benefits from superior food. 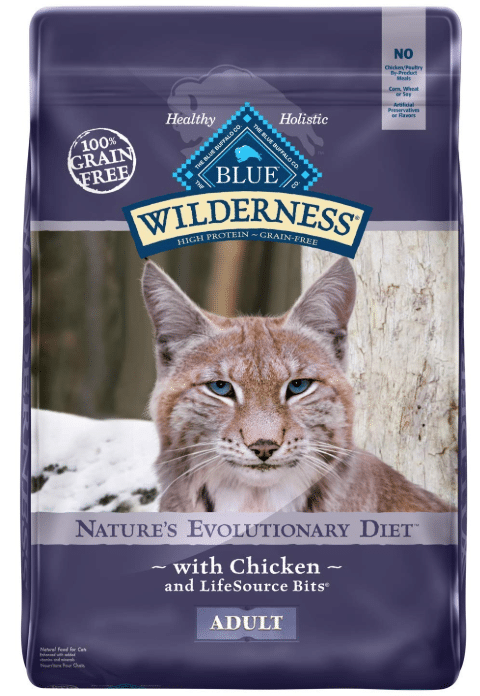 Plus, according to Blue Buffalo, this food line was inspired by the diet of a lynx, so that’s cool. I mentioned it before, but the price of excellent dry cat food is hard to swallow, at least at first. The 12-pound bag will run you $34, which is not cheap. Of course, your cats should eat less of it overall. Also, if you’re switching to really good quality foods, keep in mind the waste your cats may produce because of it. Basically, be ready to clean up some “interesting” litter. At some point, we’ve all traveled down the cat food aisle and looked at the options. One brand that you’ll always find there is Purina. It’s hard to choose a favorite, as they have so many choices, but my pick is the Cat Chow Indoor formula. You’ll need mainly-indoor cats to see the benefits, though, as most of the vitamins are made for a less-stimulating and active lifestyle. My cats were indoor animals for a while, and this was their preferred blend. I think when they started to travel outdoors more they realized that they craved other food choices, but nevertheless you can’t go wrong with this bag of food. It’s loaded with 25 essential vitamins and minerals to keep your cat healthy for longer, and packs fiber in for hairball control. I can say my hairballs diminished throughout the house rapidly when using this food. Plus, the value is pretty good overall. Sometimes, I found a lot of food leftover in my food bowls, which seemed odd. 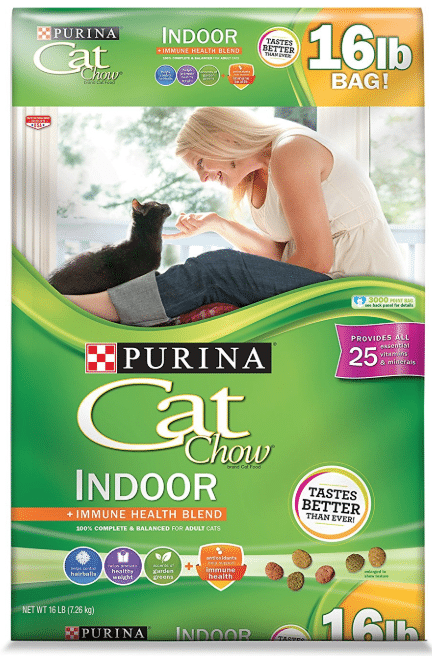 Even though Purina claims a better taste in this compound, I think my cats grew tired of it after the first bag. Also, the first ingredients include corn meal, a poultry by-product, and corn gluten meal, which doesn’t scream quality in my book. While the name may seem misleading, as a lot of cat food is high protein, the biggest takeaway with the Proactive Health products is good ingredients. You’ll find that the first three are chicken, chicken meal, and brewers rice. For me, these are better than corn meal, another form of corn meal, and some by-product of meat. This grub is good for both indoor and outdoor kitties, which is ideal if you have animals that sway in both directions. 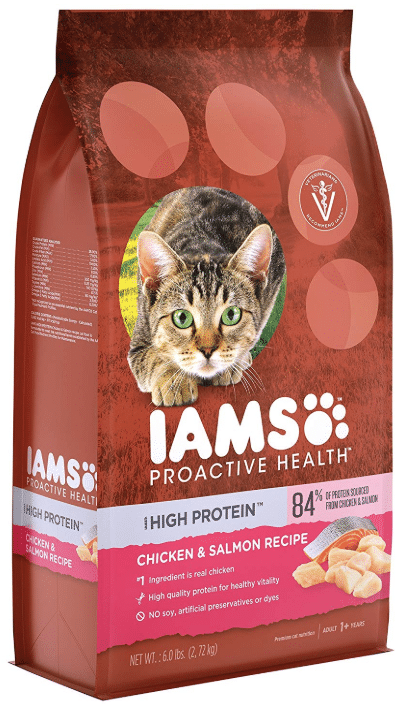 While my cats are fonder of beef and fish-forward dry foods, they took to the Iams nicely. Because of the high-protein mix and chicken as the first listed ingredient, I found them eating less and sleeping better. I know, it seems weird to say a cat could sleep better, but overall my cats’ moods were more relaxed. Even though the bag states the food will provide healthy energy, I didn’t my kitties to be any more energetic than before. Also, while the fiber blend was supposed to help the digestive systems of my animals, I found it to do the opposite. On top of that, the smell wasn’t too great. Maybe I’m used to all the unnatural flavors and aromas from non-quality ingredients being so prominent, but this food really doesn’t smell good. Maintains a good value at roughly $12 for 6-pounds. Back to back Iams products on this list may seem unnatural, but if you’ve been searching for a blend of dry food that controls your kitties’ weight and hairball, this may be the answer. The biggest difference between this and other bags of cat food comes from the weight and hairball control ingredient: L-carnitine. This magical amino acid keeps cats’ metabolism in check, which is crucial to weight control. So, when my cat had ballooned to over 12-pounds as a small-medium body shape, I had to give it a try. Overall, a solid cat food that seemed to help my cat’s weight. Ironically, I only had this issue with one kitten, but combining this food with a better feeding schedule really trimmed her down over the 8-weeks I did it for. Plus, she wasn’t spitting up meals as much, making cleanup of hairballs or other goods better. While I didn’t think her coat or skin improved much, if any, during my use. 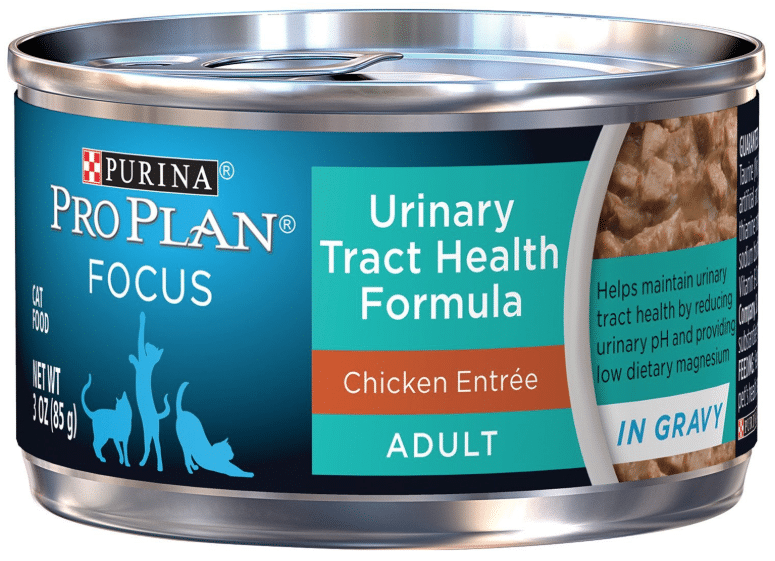 The first wet food of my list, the Purina Pro Plan can of cat food is a great addition to a cat’s diet. I know a lot of people will tell you that the best practice is to throw some in with their dry food, but I found I didn’t need to do that with this can. It’s easy to scoop, and stayed fresh for a while, which is great because I’ve found lesser brands to spoil quickly. One of my favorite things about this wet food is that I didn’t have to mix it in with my cats’ dry food to get them to eat it. My cats are definitely picky eaters, but I never saw them play or deny consuming this mix. Also, this did seem to help one of my pet’s problems with using the litter box. Plus, even though it’s a wet food, the smell wasn’t horrible – must be the chicken entrée flavoring at work. You’ll find that most of the ingredients listed are moisture-based ones, which contributes to the 78% overall rating. Sure, it’s wet food so the moisture will be high, but that’s like eating a meal that’s mainly water (soup doesn’t count.) I would’ve liked to see more protein inside the formula too, as my cats never seemed to truly be satisfied from their feedings. Also, the second ingredient is a meat by-product, rather than a wholesome meat. It seems that Purina has found a way to craft some good dry foods lately, which can be seen with this bag of kibble. This is going to sound weird, but I found the smell to be nice, almost like a pleasing pot pie sensation. So you can only imagine how good it must smell for our feline friends. Not everyone will agree with that assessment, but the point is this is made with 40% crude protein, features a good chicken and rice flavoring (which are the main two ingredients,) and not a lot of random moisture. As I said, this is a chicken and rice formula, and it really does smell like that. My cats also seemed to enjoy the flavor, even though I found later they really craved a bit more beef. The first ingredient is chicken, real chicken mind you, which makes it easier for me to trust the formula. I also found that introducing this food right away, as opposed to over the course of a few days, was fine on my kitties’ stomachs. I wish there was more fiber involved with the recipe, as even though it’s not made for helping any digestive problems, there could be more there. Purina claims that there are prebiotic fiber ingredients in there, but the mix is only at 2%, making it hard to see any results. Also, I think this food is friendlier for outdoor cats, due to the protein mixture. Just something to keep in mind if yours are more sedentary felines. We’ve all been there: down the cat food aisle, needing wet food, and grabbing a box of Fancy Feast for our cats. It’s inexpensive, yet some cats really seem to like it. 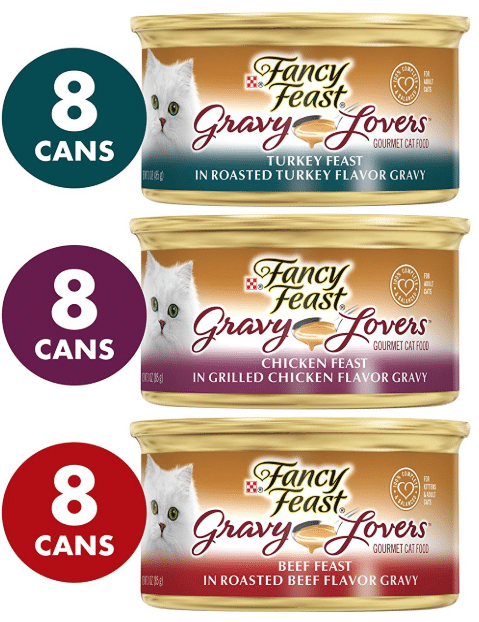 My favorite variety of these wet foods is the Gravy Lovers Collection, as it has chicken, turkey, and beef flavors all-in-one package. This means that even if your cat is sensitive or dislikes beef, for example, they still might enjoy eating it because there’s other meat inside. An easy meal for the cats that’s inexpensive, I really liked feeding this to my kitties. They seemed to enjoy the flavor, too, which made it easier. 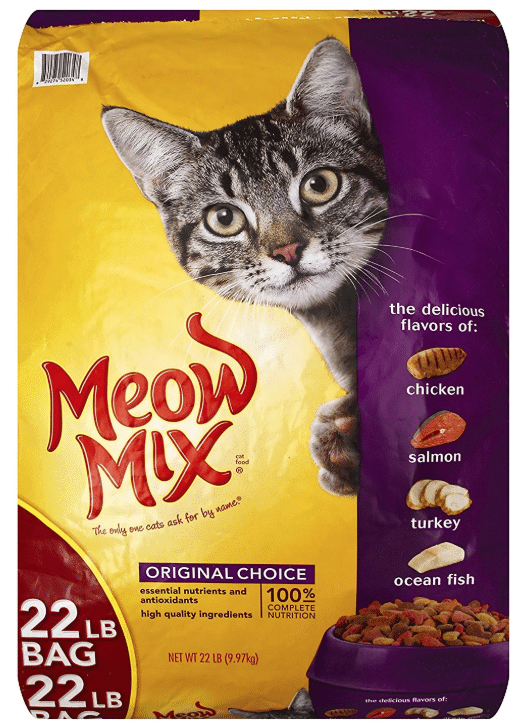 This is a balanced food, which I found to be perfect for my older adult cats who roam inside and out. Also, the high-quality meat ingredients are the first ones listed, and are even roasted with gravy to bring out a better flavor profile. Yum. If you’re sensitive to smells, it may be best to avoid this mixture. Sure, it tries to replicate that deep, smooth smell of a turkey or chicken-based gravy, but one look at it and you won’t think about anything but the trash can. Also, be prepared for many trips to the litter box, as this food seemed to go right through my pets. Best value on my list, by far. 24-cans for $12? Sign me up. This dry food is crafted specifically for indoor cats, and offers a good, healthy balance of nutrients to any kitty based inside. The 20-pound bag can be had for roughly $15, making it a good value for anyone concerned about paying high prices. Plus, it should keep your cats somewhat full, as there’s a solid amount of protein packed in. Sometimes it’s hard to swallow the fact that I needed, or wanted, to try out an inexpensive food for my cats. After all, do I always buy the “cheap stuff” for myself? Certainly not. That said, I found many different cats of my family and friends prefer this stuff over more expensive varieties. It doesn’t smell bad, and had no ill effects on the litter boxes, which is always a plus in my book. Even though, in my experience with this food, cats like to eat this stuff, that doesn’t mean it’s made from premium ingredients. In fact, the first three listed are whole ground corn, chicken by-product, and corn gluten meal. This isn’t exactly the best made food for your cat. Plus, if you’re concerned about vitamins, there aren’t as many as I would’ve liked to see packed in. You knew this was coming. One of the most recognizable names in all of cat food, and known for being inexpensive, Meow Mix Original provides the basic nutrients your cat needs to continue living. Does that mean it’s made with amazing, high-quality ingredients? No. But, cats tend to like the flavors, and when in a pinch for food, this should satisfy most felines for a few days. Of course, if your cat really loves to eat this blend, there’s no reason to stop them. While I think this food is fine, I’m not sure I’d wholeheartedly recommend it unless you need something now. It’s great as an emergency bag or rainy day-based dry food, but honestly there are better quality products on the market. That said, my cats do enjoy it, and while I think it makes for some “gross” litter boxes to be cleaned, the food nourishes my cats. I wish there were better ingredients involved, which my biggest issue with Meow Mix. I know it’s made to be cheap and fill a place in the cat food market, but I think there’s room for improvement here. When the first three ingredients are ground yellow corn, corn gluten meal, and chicken by-product meal, you know this isn’t the best you can offer your pet. Also, I noticed no difference with my cat’s oral health when I use this food, no matter for how long. Just remember that, even though these are my favorite foods you can try, all cats really are made differently. At this point, I’ve probably let my cats eat more than 20 different brands of dry food. I finally found one they both like, so even though it may not seem doable, the right food is out there. Overall, there are plenty of different options to consider, and finding the perfect plate or scoop of kibble can really make your cat’s life better. If you need more cat or pet recommendations, you can follow us for our up-to-date guides.